You would be hard pressed to find a resident of temperate North America who has never seen a Colorado blue spruce. These iconic trees are a staple of every sapling give-away and can be found in countless landscape plans all over the continent. There is no denying the fact that the blue hues of Picea pungens have managed to tap into the human psyche and in doing so has managed to spread far beyond its relatively limited range. However, despite its popularity, few people ever really get to know this species. Even fewer will ever encounter it in the wild. Today I would like to introduce you to a brief natural history of Picea pungens. Despite its common name, P. pungens is not solely a denizen of Colorado. It can be found in narrow swaths of the Rocky Mountains of Wyoming, Idaho, south to Utah, northern and eastern Arizona, southern New Mexico, and of course, central Colorado. There are also some rumored populations in Montana as well. It has a very narrow range compared to its more common relative the Engelmann spruce (Picea engelmannii). 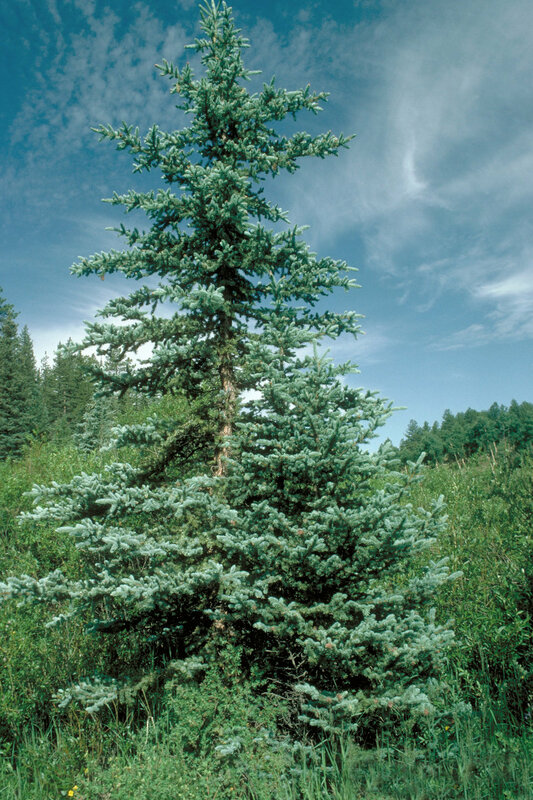 Whereas some authors consider the Colorado blue spruce to be a subspecies of the Engelmann spruce, the paucity of natural hybrids where these two species overlap suggests otherwise. It is likely that Colorado blue spruce split off from this lineage and has since followed its own evolutionary trajectory. Male cones are short-lived but quite attractive. One of the reasons P. pungens has become such a popular landscape tree is due to its extreme hardiness. Indeed, this is one sturdy tree species. Not only can it handle drought, P. pungens is also capable of surviving temperatures as low as -40 degrees Celsius with minimal foliar damage. Little stands in the way of a well established Colorado blue. In the wild it can be found growing on gentle mountain slopes at elevations of 6,000 to 10,000 feet. It is also a long lived and highly fecund tree. The most highly productive seed years for P. pungens begin at age 50 and last until it reaches roughly 150 years of age. Seeds germinate best on bare soils, which probably keeps this species limited to these mountainous areas in the wild. The typical female cone of the Colorado blue spruce. Another component of its landscape popularity is its characteristic blue color. In reality, not all trees exhibit this coloration. Its blue hue is the result of epicuticular wax deposits on the leaves as they are produced in the spring. Not all trees produce the same amount or consistency of wax and therefore not all look blue. Wax production seems to be controlled by a genetic factor and therefore is often a shared trait among isolated populations. The wax functions as sun screen, reflecting harmful UV rays away from sensitive developing foliage. This is why it is most prominent in new growth. The wax can and often does degrade over the span of a growing season, resulting in duller trees come fall. Despite how interesting this spruce is, Picea pungens, in my opinion, represents the epitome of lazy landscaping. Like Norway spruce and Norway maples, P. pungens seems to be an all too easy choice for those looking to save a quick buck. As a result, countless numbers of these trees line streets and demarcate property boundaries. Though P. pungens is native to North America, its narrow home range makes its ecological function elsewhere quite minimal. Though one could certainly do worse than planting this conifer, it nonetheless overshadows more ecologically friendly tree choices.